More than year of training and the day was finally here, surprisingly I was very calm. I had my usual 2 bottles of Ensure a piece of bread with honey,half a banana and 2 cups of coffee for breakfast and then laid on the couch to relax. Agha yes, you know it better than anyone else but just to reconfirm it from my point of view – I’m hundred percent sure that you are perfectly prepared. You proved it yourself a few weeks ago, when you went to MT and did the individual disciplines. This gave you a perfect psychological stability. I was so happy for you. Never forget during the race that you are perfectly prepared. “…One of the greatest things my dad has ever taught me and told me repeatedly is “it’s all in your mind. If you set your mind to something, the hard part is over.”. I couldn’t agree more as I have seen this many times in my own life. Not only do you have your mind set to accomplish this race, but you have a personal mission and a reason. It was 5:30 AM and time to leave. As I was walking towards the transition tent, I saw a lot of nervous faces, racers walking around with the morning cloths bag sipping on electrolyte drinks. 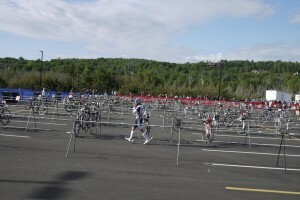 I finally made it to the transition area where I was greeted by a group of volunteers in charge of body marking. 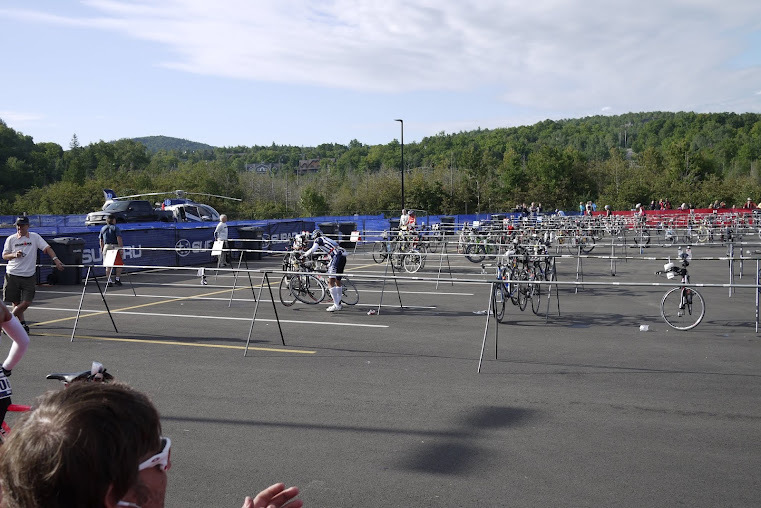 Once body marking was completed, I headed down to the bike transition area to check on my bike and drop off my bags. At this point I was a bit confused, not knowing where the bags needed to go, thankfully JJ was there to help, he told where I needed to drop off my bags but I didnt quite pay attention to what he said. 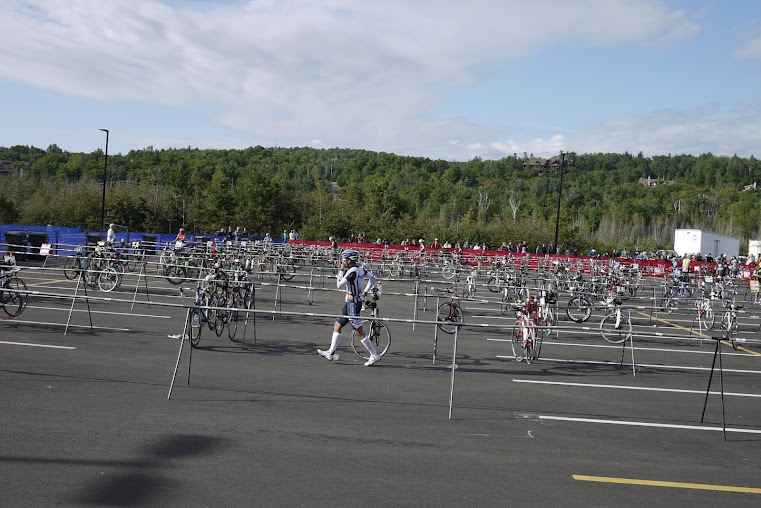 I walked all the way to the transition tent only to realize that the drop off bins were right by the bike start. I figured I might as well put on my wetsuit and as I was looking for my swim stuff I noticed that I’ve forgotten my chip at the hotel. I ran back to my uncle to ask him if he could go and grab the chip for me but as he started running back to the hotel I found the chip in my bag, race morning craziness at its best. 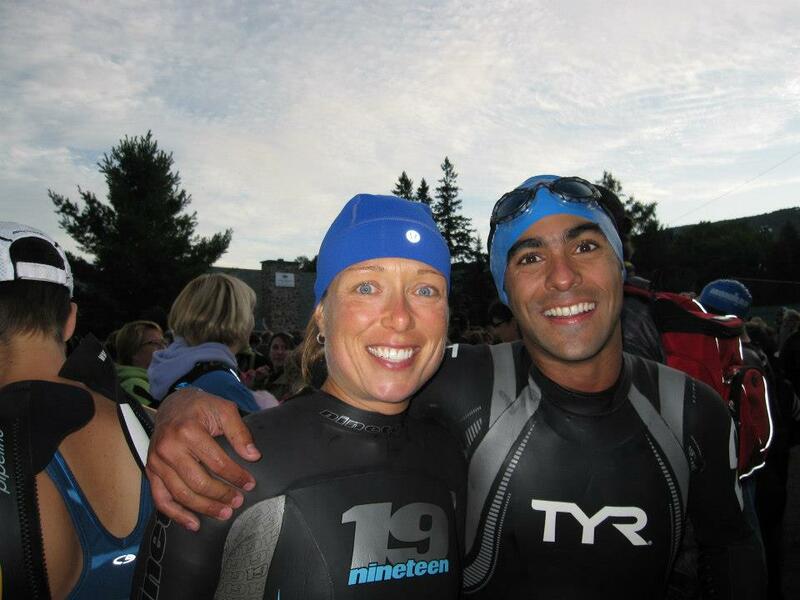 Just before I start to head down to swim start, I finally found Diana, it was very comforting to see a familiar face. She was with her parents and they seem much more in control of things than my team. We started walking towards the swim start. Athletes right, spectators left,… I probably heard that a good 200 times while doing last minute preparations at the swim start. The beach was packed, everyone was smiling, some nervously. Last minute hugs and kisses and we were off. There was a huge line up to get to the beach, swimmers were actually backed out all the way to the top of the beach. Diana and I found a little pathway and got ourselves to the front of the line, all the way on the left side as it was said in the plan. There was no time to warm up for the swim, we just had to do some quick arm swings to raise the blood pressure, not that it was needed. Before I knew it the cannon went off and pros started. I can’t quite remember how the next 10 minutes passed but I remember seeing the jet fly by and then hear go go go. Diana and I were at the far left attached to the platform that was setup for spectators and camera crew. we started walking slowly to the end of the platform and then it all started. I reminded myself to stay calm and try to find my breathing rhythm and then I remembered my dad, with my head under the water, I remember trying to call him, pedar. It was time to focus, slowly but surely I made my way through the swim course, I felt very comfortable and confident that I could cover the distance with no problem. Every time I saw a buoy in the distance I tried to get as close as I could to it , making sure I don’t get myself into thick of things. I had estimated that I will be swimming an extra 100-200 meters as a result of swimming further to the left, but that was ok. I just needed to get to my bike. 400 meters into the swim and as expected my Garmin dropped the signal. I never got the chance to test if this was because I was wearing the 910 under my cap. I guess thats something I will have to figure out after the race. The next 2.5K of the swim was fantastic, I was breathing properly, I had open water and every once in while I found some good legs to follow, the swim could not be any better than this. Almost 3K into the swim I started feeling the fatigue in my arms. I tried to ignore it, but it stayed with me for a next few minutes. I decided to do 50 DPS to give my arms a bit of a break, this was something that I’ve practised on my own. I did 50 DPS followed by 100 stroke and then another 50 DPS. I felt better and I was not able see the island. As said in the plan the water got shallow close to the finish area before it got deep again. I see other swimmers trying to stand up and run but they struggle. I kept swimming and I could now hear the crowd. For the first time in the last year and half I ran out of the water not being exhausted. I was happy, the guy beside me did a somersault as he ran towards the wetsuit ripping area. The crowd went crazy. After taking off of my wetsuit I started running towards the transition tent while looking for familiar faces, and there it was my aunt with her Blackberry ready to take a photo. I high five her and continued. 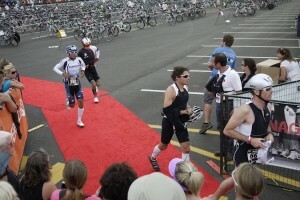 The run to the transition was pretty fast, the crowd was very loud, the atmosphere was just fantastic. 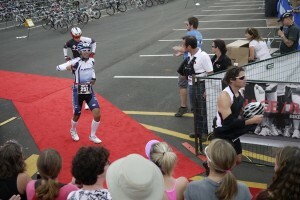 There was chaos in the transition tent, I grabbed my bag and then head to the change area. It took me a while to find an empty seat. I remembered Sylvie’s words, this is still part of the race, don’t rush but don’t waste time either. I quickly changed to my bike gear while sipping on a perform and headed out. 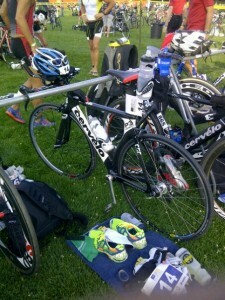 As expected a lot of the racers have already left and my bike was sitting almost alone by itself. Nothing to worry about though, this was just part of the plan. Out of the transition area, I ran a quick check, all systems were go. Through the constant cheering of the crowd I made it to Monte Ryan where I hit a traffic jam, again I reminded myself that I needed to let my body warm up for the first 10 minutes, but these riders seems to be too slow for a warm up. It was time for the first pass on the bike. I passed one person quickly and got back into the line. I was nervous about being caught drafting so I decided to go for another pass and before I knew it I was sitting in the left lane, passing a whole bunch of riders. As I was just about to pass a group of 5 riders on the first hill of Monte Ryan, I noticed the officals’ motorcycle pulling beside me and then slowing down to my pace. I quickly sped up and passed the group and merged back to the right lane. Officials stayed with me for another 10 seconds which felt a lot longer and then moved ahead. I took a deep breath, quickly checked my numbers and refocused. I dont remember a whole lot about the first loop of highway 117. The ride was pretty uneventful and I remember feeling really good through the ride. 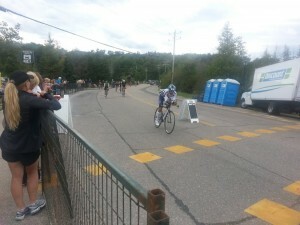 I saw Nigel, Sylvie, Brandon and few other NRG athletes on the ride. It was certainly a good decision to wear the NRG gear through the bike ride. Before I knew it, I was off 117 and heading into St. Jovite, and it was rockin! The streets were packed with people, banners and volunteers. Lots of cheering, lots of cowbells. My favorite was the guy in the BBQ apron that looked like Michaelangelo’s David (without the leaf). Heading back to Monte Ryan I felt really good I was partially excited to see my team and as expected as I made the turn to head to head up lac superior, I saw the whole crew, I gave them a thumbs up indicating things are going well and headed for fun ride up to lac superior. The first loop to the lac superior went very well, I was really comfortable climbing and I had no problem controlling my power. Once on the top I remember thinking, as it was exactly stated on the plan, this wasn’t too bad, I can do this again. 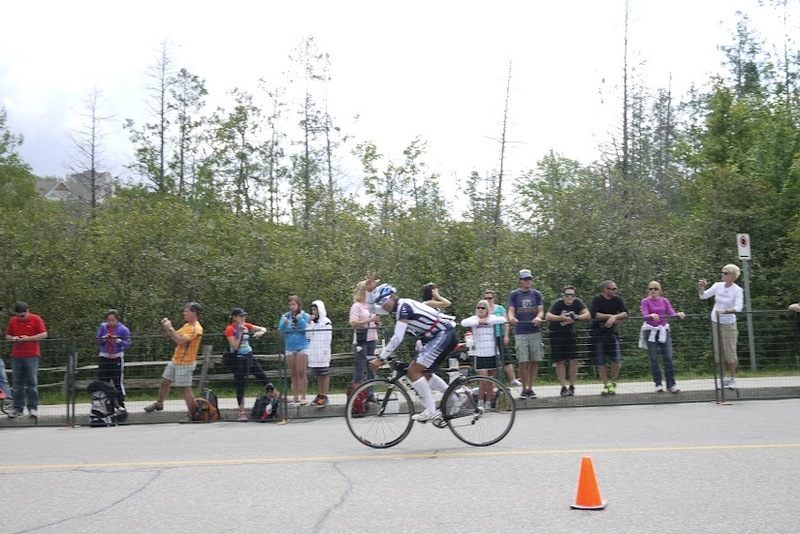 Just before I head back down to Tremblant, I passed by Eric, it was a great surprise as I did not expect to see anyone from the UofT tri club on the race. We wished each other good luck and I was off for a quick and fast ride down the hill. Pumped from being able to making it up the hill comfortably I decided that I dont need to pickup my bike special needs bag. I went through the rest stop quickly and after getting another boost of energy from the team I headed for the second loop. Overall the first loop went really well, I was on top of my nutrition and there was no sign of cramps in my legs. Perhaps the only mistake that I made was not to lap on my Garmin after finishing the first loop, I thought about it hard and then I decided not to do it as I was worried that might start chasing the numbers and push myself too hard and although I purposely backed off during the second loop, having clean view of the second loop would have helped me to manage my power a bit better. All was going as planned in the second loop until the wind caught us on 117. I could almost see the turn around point on 117 when things really started to slow down. As per plan this was almost expected but the big surprise of the day was the stronger wind that hit us on the way back to St. Jovite after the turn around on 117. perhaps the only time of the day that I had to dig a bit deep was the 20 KM ride to St. Jovite. Looking back at the race I could have certainly pushed a bit harder but though this portion but the uncertainty of marathon held me back. All that said I was relatively feeling good, my nutrition was all going as planned and my legs were still in good shape. The rest of the second loop was pretty quiet, I certainly felt more tired but I was still feeling good. I was becoming a bit anxious on the way up to lac superior, hills seemed longer and steeper but I had a marathon to worry about and that kept my head off from the hills. I grabbed a bottle of perform on the way back and started sipping it on the way down, getting ready for the run. Off the bike I started running, feeling really good, to the transition tent, this was when all my doubts for the run went away. With the help of an amazing volunteer I quickly changed into my run gear and headed out for the course. This was the best I have ever felt out of the bike transition of any race in the last two years. Out of the gate and not even a 20 meters out I heard my name, it was Diana’s dad, and this was all I needed to ignite my running engine. I started sprinting up the hill browsing the crowd for my team and sure enough half way through up the hill, I saw my sister, Pouria, Shannon and JJ. I can’t describe how amazing it feels to see a familiar face through the race but hearing a big group cheering for you right out of the run gate is all you need to make it through the first half of the run. The run was the best part of my day, feeling a bit nervous from y half experience in Peterborough, a good start in the run gave me the confidence that I needed. I ran the first 2K on 4:35. Once I realized how fast I was running I slowed down and started to focus on my rythem and think about nutrition. 7K in and it was the first time through the race that I saw Diana, she cwas a good 6 K ahead of me, we smiled at each other and continued. The last 20K through the run was rather emotional, I knew the end was near and I just felt the urge to share my story. 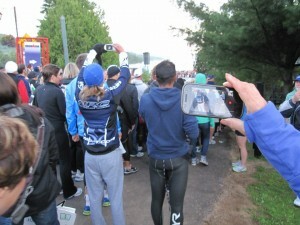 A few times I felt like pulling right by other runners and tell them who I am running for but this did not happen until the last few Ks of the run. 5 K to the finish and right in the middle of heavy a rain is where I met Allen, we ran the next few Ks together and chatted a bit. He told me with our pace we’d be able to finish just before 12 hours mark and that was the first time I realized how long I’ve been running. I asked him why he was doing this and told him my story and with that off of my chest I was ready to cross the finish line. My brain was blocked, I was nto thinking about anything, couldnt even rememebr that I had a whole crew waiting to greet me. I was just overwhelmed with the thought of having finished an Ironman. After getting my medal and finisher shirt, I got in the line for some food. I saw Andrew and Nigel on the line and we chatted a bit about the race and our amazing experiences. Next I saw Diana and her family we congratulated each other and finally I saw my family. After a couple of minutes of emotional hugs, kisses and tears it was time to head back. We said farewell to Diana and her family and I went back to the transition to collect my bags. The day was over, mission accomplished and a new goal for 2013 was set. Its time to put the feet up, relax and reflect on the journey, the race is just around the corner. 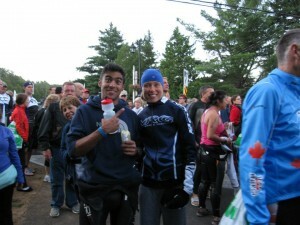 On June 2011, I made the decision to particiapte in my first Ironman event in memory of my father. 14 months later and after many hours of intense training, I am ready for the big task. To celebrate his memory , we have decided to use this event to run another fundraising campaign for the Children of Lahijan. During our last two fundraising campaigns we managed to raise a total $6000 that allowed us to purchase clothing for 125 kids in Lahjian. Our goal for this round is to raise $3000. To honor our donors, for our third campaign we have prepared something special. Donors who donate a minimum of $50 will receive a “Children of Lahijan” T-Shirt, designed by our good friend Atee Zolghadr. The day started pretty well, I was rested well and felt calm, Diana certainly helped in that department. We did a quick swim warm up just in time for the start. I felt good through the first half of the swim, the second half was a bit tougher and my pace dropped. I obviously need a lot of help in the swimming department, it might be too late now but this would something I will definitely work on the next winter. Overall it went pretty well. I was a bit uncomfortable on the ride back and had slight mechanical at 20 K into the ride which I have myself to blame for. My chain came out due to some bad shifting. Unfortunately it was at the start of the hill so I ended up losing more time there. Beyond that, the ride back was a long haul of me battling the cramps. The cramps were both on my thighs and calves. In one way they worked well for me because I was not able to reduce the pressure on the pedal as the cramps would get worse but I was a bit worried about the run. The cramps got better over time but they did come back towards the end of the ride. 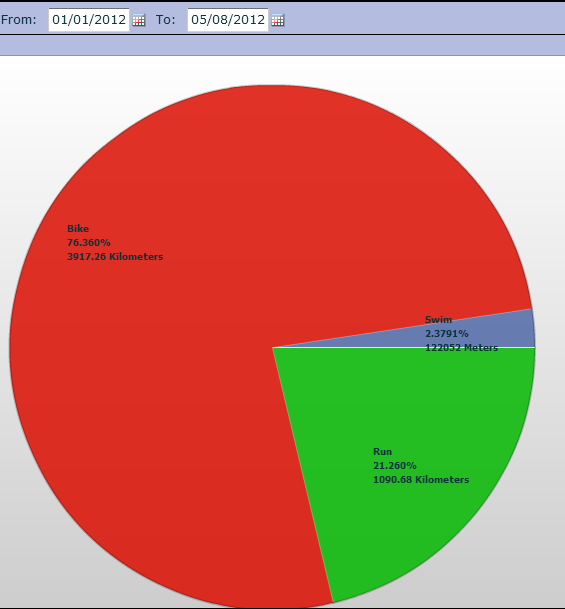 The rest of story is on TrainingPeaks, at least the VI is not as bad but I think I still need to work on a few things. 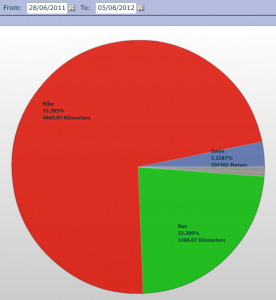 As for nutrition, I stuck to the plan but I think I can perhaps make some adjustments in that department as well. I didn’t necessarily felt low on fuel but I as you’ll see later I may need to do something a bit extra for the start of the run. T2 was also smooth, although (this is probably normal) when I got of the bike, I had some serious pain in my legs which went away pretty quickly. Terrible is probably the right word to describe the run. It started with some cramping which I ignored as I was sure it would get worse if I stopped. I kept the pressure for the first 2 K and at some point the pain became unbearable so I walked about a 100 meters. I restarted after getting some Gatorade at the aid station, but here is where I felt I could use some extra nutrition, I did have some gels with me but I didn’t want to deviate from the plan of drinking Gatorade so I avoided them (Note to self, Need a plan B). I was feeling alright, slower pace between 3 and 10 but it was between 10K and 14K mark where I really blew up on those hills, I simply didn’t have the legs to run them. Interestingly after 14, I picked up the pace again and I did much better, but the damage was already done. There is two and a half months left to the big event and I’m dialing it up by day. I just wrapped the first race of the season and I’m very happy about my performance. Milton is a pretty challenging spring course but certainly a great race to kick off the season. 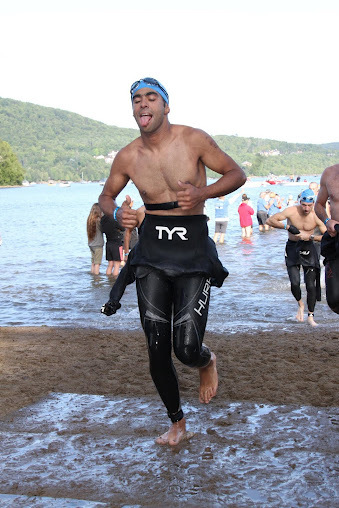 While I have seen big improvements in my run and bike, my swimming stays constant. To make any significant changes to my swimming pace, I will have to spend a lot of time and that’s not a luxury I can afford right now. I’m just going to focus on endurance and strength and try to wrap it up with a decent pace, I will have quite a bit of time to move up the ranks on the ride. The bike course was as difficult as I expected it. It was certainly a smart idea to go and checkout the course a day before, the 6th line hill could shock you if you haven’t seen it before the race. As per Sylvie’s instructions, I kept a steady watt around 250 on the hill. I made sure that I have enough power to push over the top and attack the rest of rollers. For the next 10 K of the ride I pushed hard and rode smart, approached every hill with a good momentum and made sure I push off the top of it. My power averaging around 210 watts. The run was the portion of the race I had the least idea about. 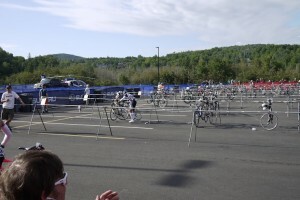 With the exception of the short hill right out of the transition area, I did not know much about the rest of the course. It actually turned out to be a good thing at the end or otherwise it could have slowed me down. I ended up setting one of my fastest runs despite the challening and up hill first 4 KM of the run. I ran a 4:02 on the second half of the course for a total average pace of 4:25. Overall I’m very happy with my performance, Its now time to log some 5 hour rides and get ready for the half Ironman race. This is going to be really good. Lastly, here is the link to my pre-race warm up track, one of my most favorite essential mixes of all time. Got a massive boost this afternoon at the 21 K mark when my ipod shuffled to a power booster by Saied Shanbehzadeh, I wish we could carry iPods at races. 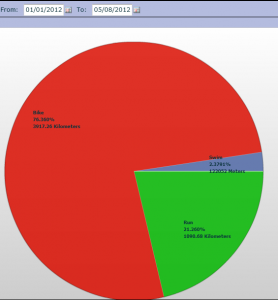 My FTP now sits at 236, not bad but there is still a lot of room for improvement. 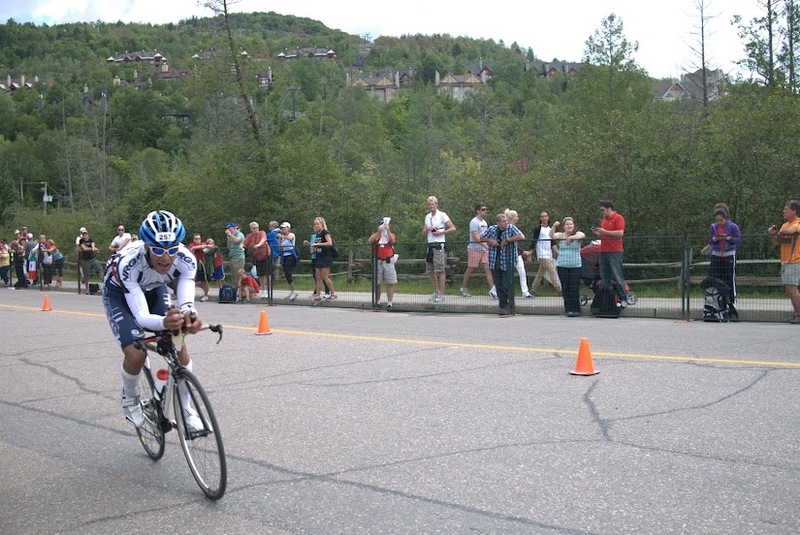 Personally I’m targeting and average of 180 – 200 watts for my ride at the race. I think I have enough time to get there. Next few months is going to be a lot of fun. Biking: My Saturday bike rides are now up to 3.5 hours, I’m averaging at 150 watts, this will obviopusly change when I hit the outdoors which should not be too far in the future! Running: Sunday runs are now up to 2:20 , I’m pacing right around 5:00/KM for the long run and 4:40/KM for an hour progression ride. Swimming: Thing have certainly improved since I’ve been back at the pool, my technique has improved but I still have a lot of work to do on my left arm and body rotation. My Sunday swims are now up to 3K and I’m focusing on a race pace of 2:00/100m. At the pool I’m around 1:45/100 for the short distance. I’ll just have to wait and see how things turnout in the lake. Nutrition: This is the only part of my training plan that I’ve been slacking at. I am planning to organize my diet by the end of March. I think I still need to lose another 5 pounds for better performance but I’m not too worried. I’m sure summer rides and runs will get me there. That’s all the update for now. Stay tuned! Flashes, Tears, Hugs, Emotions … we all dream about that moment. Those of us who have made the commitment and go through countless hours of training constantly dream about the finish line. My mother does what I do for a few hours a day …. around the clock, day in and day out … she’s been doing this for 30 years with no finish line to dream about. She’s the strongest person I know , better than world’s best endurance athlete. There are days that you just feel you can go forever … today was one of them!